Recently there has been a step back to the cinematic style of the 1980s, and with it the movies that use this style are bringing back a forgotten (by some, not by me) format, the VHS tape. Drive and Hobo with a Shotgun are two of the earliest versions I can think of that have encapsulated the spirit and aesthetics of the ’80s. Hobo with a Shotgun in particular takes the gritty, grimy feel of the VHS phenomenon and brings it right back to the modern-day. Turbo Boy also follows in this vein, while V/H/S brought a more gritty view of the found footage genre. Wolf Cop may not have had the same color scheme as many of the films from the ’80s, but it had that sense of wackiness, fun and violence that I would expect to see from VHS of that time. But these motion pictures are not the only way to get a VHS fix (outside of collecting them yourselves). The small screen is showing its love of low-budget affairs you could only find on the shelves of your local rental store. 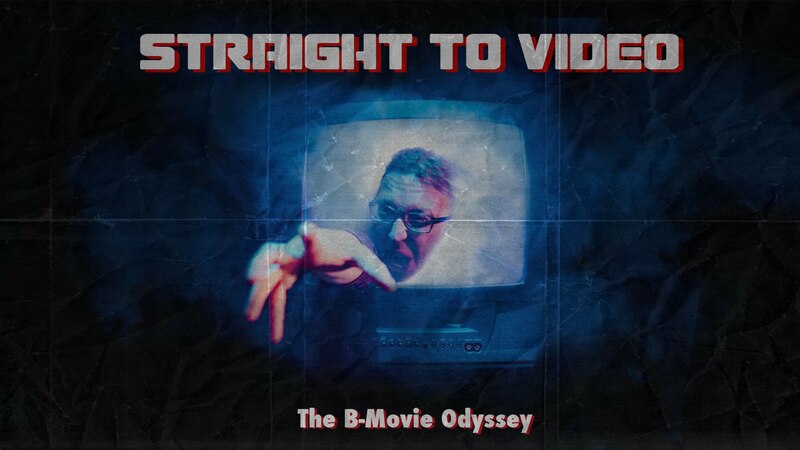 Today, Grizzly Bomb would like to introduce you to the House of Heathen’s Straight to Video: A B Movie Odyssey, which feels like you have found a time capsule full of VHS gold. Straight to Video started out as a series of shorts on YouTube under the name The Last Video Store. It follows the quite retro and very surreal adventures of a video store owner and his numerous friends. Set in the store, it creates its own universe based solely around VHS styled events. Its style is heavily influenced by VHS culture and fans of the format will love these shorts. However, it is also easily accessible for fans of great filmic story telling. These shorts have now been expanded out into a short series. Story Hive has helped bring this series to life by showcasing the pilot episode, as well as many other professionally made shorts by film fans and enthusiasts, all while letting people vote for ones they wanted to see made. Straight to Video was one of the chosen. Below is a synopsis of the show. Kevin, jaded video store owner, rises from behind a desk, jerry can in hand. Gas splashes out onto racks of movies. The video store has met it’s end, the love he had once had for the films of the straight to video era is gone. His bags are packed behind him; he strikes a match. The return slot flings open and gusts of air howl through the room; dousing the flame. A mysterious BETA case drops in from the opening. Curiosity piqued; he puts it in his vintage player. The TV screen flickers momentarily; then erupts as a large rotating black hole vortex pours out. Everything in the room collapses, pulled into it, including Kevin. Screams and ominous laughter wake him. In a twisted turn of fate, he is trapped inside his B-movies, and must fight the terrors around him to end this video nightmare. Just so you can get an idea of the visual style involved in these pieces I have enclosed a gallery of some of the episodes highlights. Notice the pretty sweet marketing tools they used here like the fake movie posters and VHS covers for Jack J.Jackson, who appears in one of the episodes, as well as the great trading card styled designs on some of the other posters. Now we have the episodes themselves. Here is a very brief description of them, so you get a taste of what you are in store for when you watch the series. Episode 1: Beaver Lake Massacre – Like in the pilot, Kevin is sucked into the movies he loves so much, this time a Friday the 13th parody. This episode covers pretty much every genre convention of the Jason Voorhees films you can think of, and crams them all into a great 5 minute introduction piece. Episode 2: Gong Tao Justice – Focusing on action superstar Jack J.Jackson and his Asian mystic cop counterpart (who is actually Kevin), it follows the template set out in Collision Course (1989) and Rush Hour (1998) they must work together to fight vampires in New York. As well as being a perfect fusion of eastern movies and ’80s action flicks, it also has a flying female head in it, which is pretty darn awesome. Episode 3: Space Crashers – This one is a Star Wars parody which comes very close to being a kindred spirit of Star Crash (1978), which in itself was a Star Wars parody and an incredible one at that. Poorly face-painted colored track-suited aliens fight the evil empire that Kevin has infiltrated. The switch-blade lightsaber and over the top costumes are among the many highlights of this episode. Episode 4: Prey Stalker – A Predator (1987) clone, where Kevin’s interruption into the story line actually changes the ending, leaving the lead dead and the Jesse Ventura pastiche as the man left to kill the creature that has destroyed his friends. The love of the movie Predator is seen throughout this piece, and whole scenes are re-imagined in the Straight to Video universe fashion. Episode 5: The Exit – Taking elements of cyber punk and mashing them up with late 80s/early 90s features like Johnny Mnemonic (1995), The Lawn Mower Man (1992) and Arcade (1993) has Kevin finding his best chance of escaping this VHS nightmare via computer virtual reality. Film fans of any decade can enjoy these amazingly crafted shorts, which take the elements you remember most from films of the ’80s and ’90s in the VHS style, and creates a whole new world of it. The love for this era of filmmaking can clearly be seen in each episode, and the whole project is incredibly well acted and put together. Most importantly of all, its a lot of blooming fun! Here is hoping that House of Heathens manage to do a second series so we can find out exactly where else Kevin will be transported next in his VHS based adventures. If you want more YouTube based treats then how about our Halloween Horror Shorts collection? Looking for other interesting YouTube videos? The Unknown Fan Films will give you a wide range of different shorts to choose from. While you’re at it look at our Undiscovered Action Movie Gems. Also check out the rest of our Countdown to Halloween and the VHS Vault for more VHS related reviews. Images: House of Heathens, Story Hive, CineCoup. Previous PostBorn To Be Blue: Ethan Hawke’s Chet Baker Biopic Bought By IFCNext PostVideo Details The Visual Symmetry In Escape From New York And Escape From L.A.